The highlight of my childhood summers was visiting my grandmother’s ranch in the Colorado mountains. A walk through her rustic yard was to know her heart. A profusion of flowers and raspberry bushes laden with sweet fruit drew butterflies, filling the garden with color. In the evening, we would fall asleep watching a tangerine sky go dark, then awaken to diamond-dust sunbeams dancing across the room. Lollipop Garden is a scrapbook of those lovely days. My Lollipop Garden quilts have been quilted and bound, and I’m excited to share them. 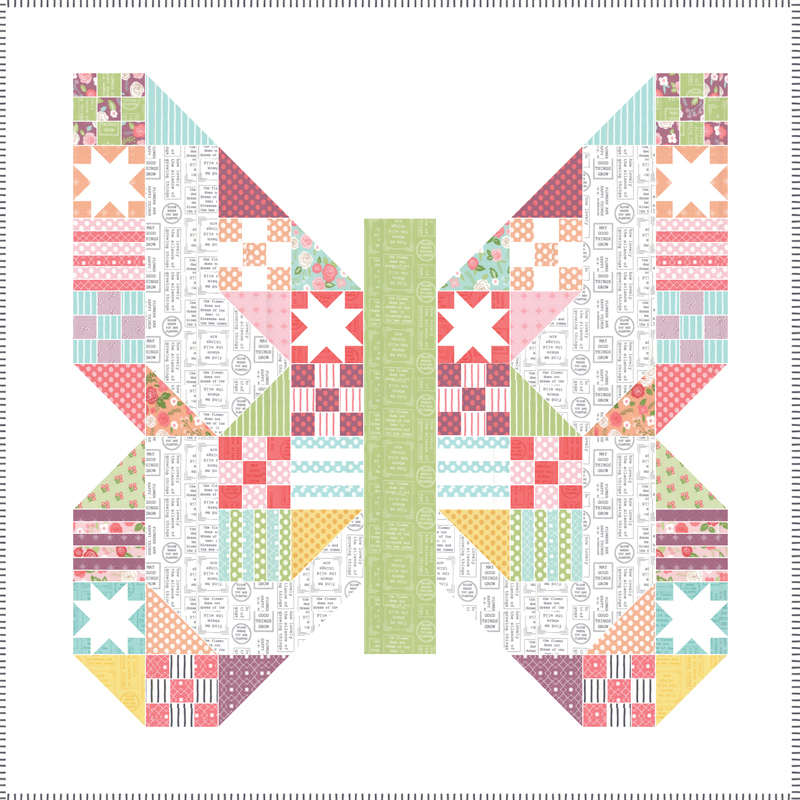 First up is Butterfly Patch – it’s inspired by my bestselling Social Butterfly block. This is a beginner-friendly project made with one Layer Cake of Lollipop Garden, a few text prints, and of course the tonal white-washed dots for the background. It’s got the feel of a sampler, but this comes together so quickly. Next is Diamond Dust. 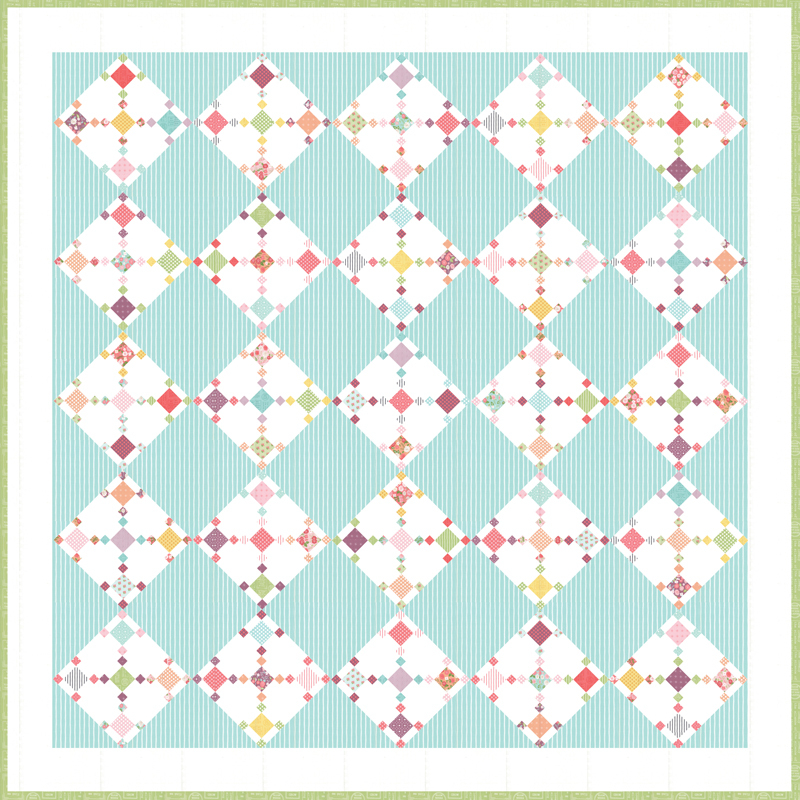 Lately I have fallen in love with quilts made of tiny pieces and so of course I had to design one. 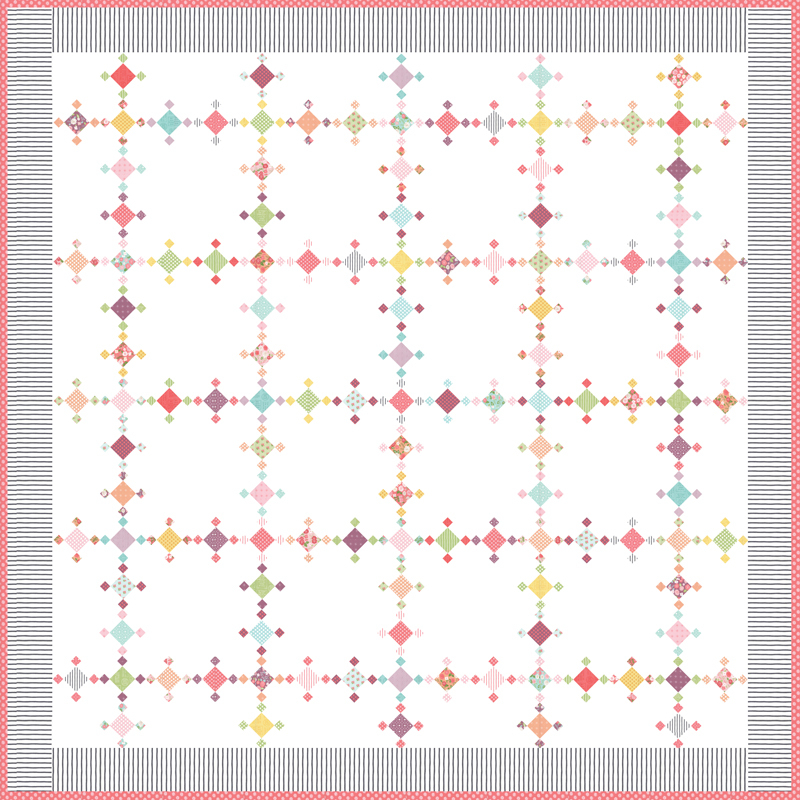 This quilt can be made a number of different ways – an all-white background, or with a checkerboard background using an accent color. Make it with two charm packs, six mini charms, nine fat eighths, or scraps. There is no wrong way to make this – use all of one collection, or mix them all up. Diamond Dust. My finished quilt – and now I’m even more in love with the tiny pieces. Speaking of mini charms, I’m over the moon with this sweet little pincushion. It’s a micro version of my Open Heart design – the block finishes at 4” x 4″. The pieces are tiny, but the trick is to press the seams open. 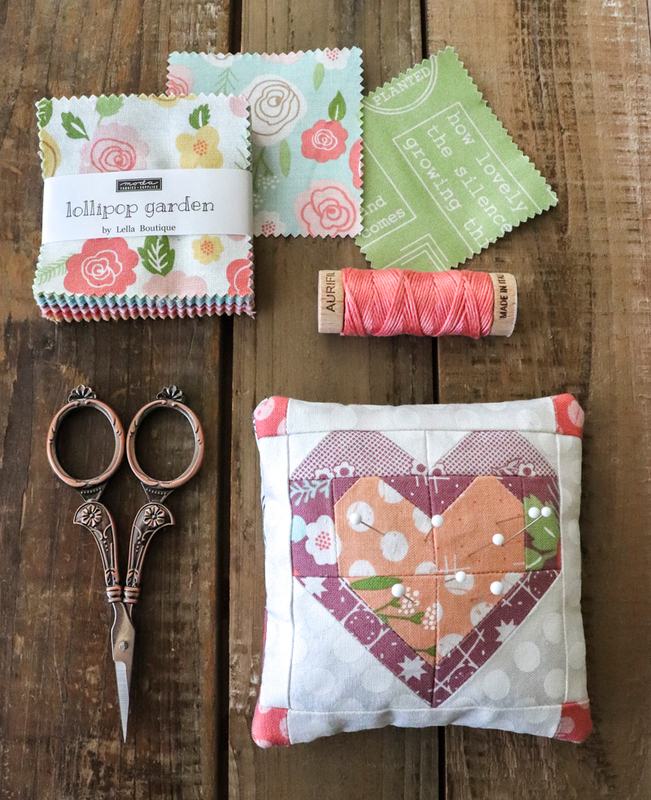 What I love most about this pattern is that one mini charm pack will make three pin cushions. Perfect for sharing! I want to make more of these using every one of my collections – Mini Open Heart Pincushion! Square Dance? This one is log cabin-ish and I believe any jelly roll would look fabulously good plugged in. I love scrappy quilts – they remind me of the quilts I used to see at Grandma’s house growing up. It’s funny how quilting has changed – we buy yardage now, but Grandma’s quilts carried bits of old aprons or dresses, whatever they could find. Square Dance reminds me of those old quilts with its hodge-podge sort of charm. One Jelly Roll is all Square Dance needs. This one turned out to be just lovely – I wish you could see it in person. 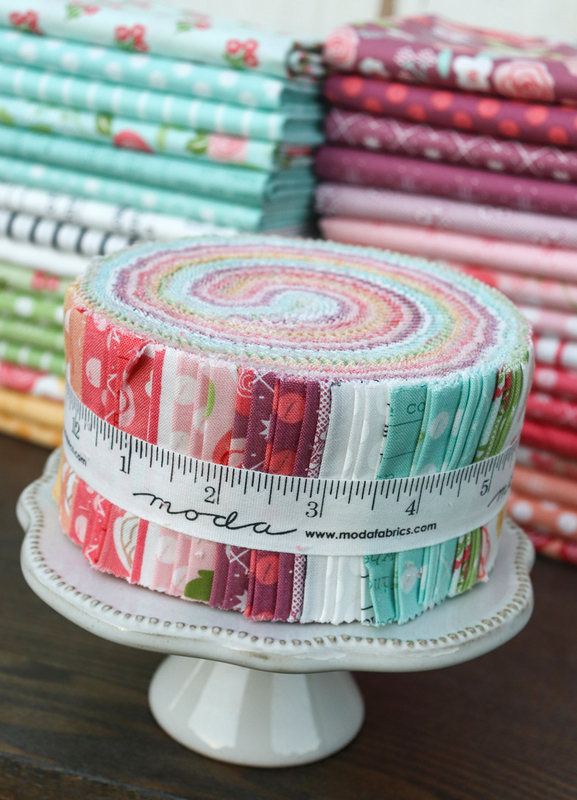 (You can make this one with fat eighths or fat quarters and it is set on point. It was hard to decide which color to use for the setting triangles, but aqua… it is really hard to beat! That’s all for Lollipop Garden. I hope it evokes happy memories for you… or that you’ll create quilts and projects that will become part of memories you make. P. S. All images by Vanessa Goertzen. Very pretty fabric. Love all the patterns, especially the butterfly. Love Lollipop Garden. My grandmother also had a yard full of flowers, raspberries, currents and blackberries. What a wonderful way to honor your fond memories. I love Diamond Dust ! What gorgeous patterns and fabrics ! Absolutely beautiful, all of them. Beautiful, both the fabrics and the quilts!!! Beautiful. I love Diamond Dust and Bling. Both gorgeous. Congratulations on the luscious line of fabric. Very pretty! The coral red and aqua are just yummy! What a beautiful collection! I can’t wait for it to arrive at my local quilt shop. I’m sure they would not have been able to resist it. Where can I get these patterns? Love the patterns, fabrics and machine quilting! Just beautiful!!! Another AWESOME collection with a wonderful story behind it! We are first time grandparents to our little guy Bennett and he LOVES coming to Nana & Papa’s house. They are in Atlanta and we are in Northern Ohio. He is just going to be 4 on June and I hope he has many special summers here with us as well!! ❤️❤️❤️ Congrats on another collection!!! 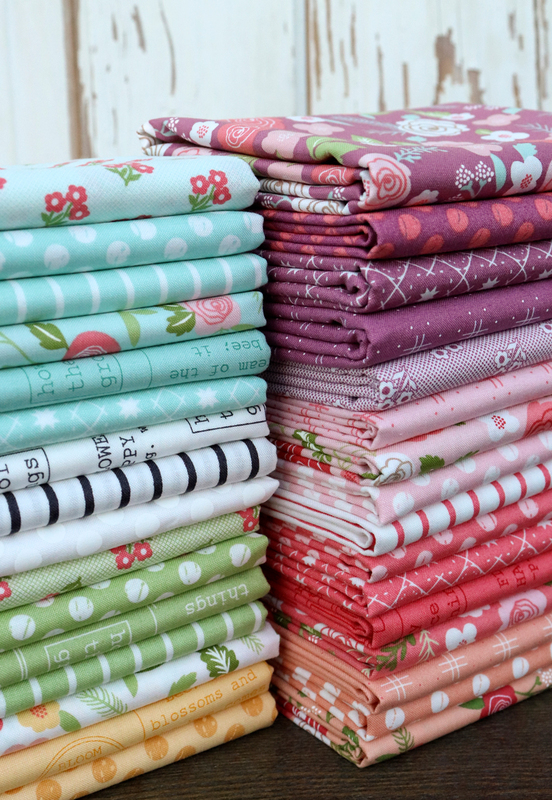 Love all of Vanessa’s fabric lines and have bought quite a few of them. The quilts are beautiful. Love her pattern designs too. Love the line as well and very interested in the patterns … Available yet? You never cease to surprise me!! Every one is delish!!! This fabric and quilts are gorgeous!!! !